Now for something completely different, of the photoshop variety. I must say this is pretty clever and a tip of the hat to the creator-whom I can’t seem to find. The link for the image sent me here, then that link sent me to here. So I was not able to find out who is the artist/creator of this image. No luck. So; my guess, it was created for some contest on Worth1000.com. If this great image is not from there I don’t know where it’s from. Wherever it’s from I really would like to acknowledge the creator. Why was it on BLDGBLOG? Geoff was posting about how the last Ice Age, and the subsequent landscapes-led(in a round about way) to the 1st golf courses created in Scotland. From there that topography had golf course designers borrowing the same formed landscapes and re-creating that typography around the World, it’s a very informative read. The above image was at the end of the post as kind of an exclamation point and was a good ending. 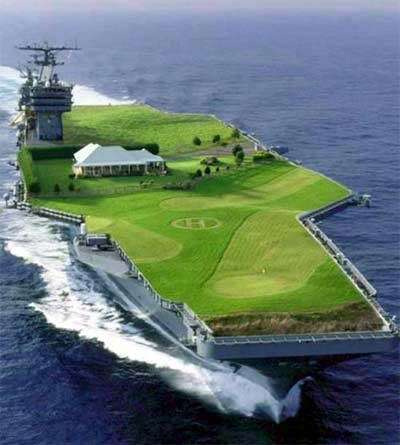 Ice Age, Glacial fields, kettle ponds, moraines, Scottish sheep shepherds, Indian Burial Mounds, bulldozers, golf fanatics, and designers all the way to images on Aircraft Carriers via photoshop . . . it sure is an interesting world we live in. Addendum: You gotta be careful going out that driveway! U R ALL FREEKIN MORONS MY UNCLES IN THE MILITARY SO KISS MY @$$!!! NO $#!^ there is no boat of grass, its a funny photoshop pic. Ha! I came across that before. If I had to reenlist, Lord, let this be my next duty station. That is so cool.I hope some one does that for real and turn all the compartments into Hi rent condos and apartments.The Carrier I was on (CVA-59) had a 4 acre flight deck and housed 5,000 people. In turn that could meen big bucks. Uh, yeah . . . I think we all know that. But we appreciate your comments. I think it is brilliant. First I asked my friend if he wanted to join the Navy, he said no. Then I showed him the picture of the golf craft carrier and he replied positively. Though I prefer it with planes roaring off into the sky from its bow, I still love it! I eject this in space a million times! Her Majesty`s Royal Navy uses an english invention called a slope deck. Imagine the arguing if one `rolled in` on the 18th. Would one still have to get a round in, Pink Gins included, What Oh! old chap! Hear here!!! Thanks for posting. hi gd evng,it’ great to see that unimaginable images of aircraft i m very happy and excited to receive your updates. This company is Dope. They have creativity that is so lacking in skateboarding today. Being good at skateboarding is not as important as having fun on a skateboard. Watch when Palace drops in the US some big companies are going to feel the pain of what these guys are capable of.